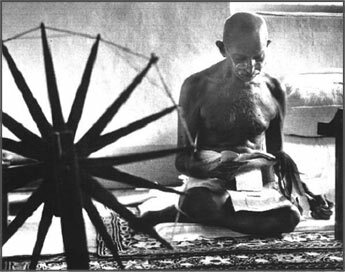 Mahatma Gandhi was born in Porbander, which is a small town in Gujarat. He was born into a family of humble origins. His father did not have more than an education of the third grade, and his mother was illiterate. Most of the other senior members of the Gandhi family also had very meager academic education. Mohandas Karam Chand Gandhi was therefore the very first person from his family to obtain the degree of graduation from a high school. However, it is also to be noted that his academic achievement was below average. And in spite of such humble beginnings and a below average performance in the academic fields, Gandhi went on to become the most reckoned leaders of India who led India to achieve the state of freedom. This is because, though Gandhi's parents could not impart much of academic education, they ensured that they instilled in him a strong character education. It is this very strength of character that later enabled Gandhi to educate himself and complete the London Matriculation as well as the London Bar examinations. It was this very strength of character that stood by Gandhi when he later went to South Africa. His sound character proved to be his main strength in the difficult circumstances that prevailed there. It was with the help of this asset of character that Gandhi managed to overcome many seemingly insurmountable obstacles. Not only that, Gandhi also took it upon him-self to impart character education to thousands of almost illiterate Indians in South Africa. If the main element of Gandhi's success were to be traced back, then it would become clear that his strong sense of character was the unique asset that he possessed which assisted him during his crises in South Africa as well as later in India, with his unique weapon, 'Satyagraha', whose implementation primarily requires lesser academic education but a very strong dosage of character education. In a particular presentation that was made by Dr. Shall Sinha, he discussed the techniques that were used by Gandhi to teach the value, acquisition and implementation of character education. According to Gandhi, there were four vital elements of character education and these elements also help in academic performance. One of the most memorable quotes by the Mahatma on education sums up aptly what he felt about the subject: "Education without courage is like a wax statue - beautiful to look at but bound to melt at the first touch of a hot stuff." – Mahatma Gandhi. And although he had the largest and strongest following in terms of numbers, Mahatma Gandhi did not consider it his greatest strength, he believed more in the strength of character. The following quote by him sums up his view on the subject: "Strength of numbers is the delight of the timid." – Mahatma Gandhi. Why English is so difficult?